Lace up your shoes, cause it's time to use your feet to defeat Breast Cancer! Our mission is clear – we need to raise awareness about breast cancer to save the lives of those we love. When breast cancer is detected early, the five-year relative survival rate is 98%. The Pink on Parade Walk, and its associated marketing campaign, will help raise awareness about breast health issues for both men and women in our area. By walking on October 20, building a team, and spreading the word you are directly impacting the health of our community and the hold breast cancer has on it. Pink on Parade will also raise money for The Pink Ribbon Place, Riverside's first breast cancer resource center. The Pink Ribbon Place's goal is to improve the qaulity of life for those impacted by cancer, before, during and after treatemnt. All services offered at The Pink Ribbon Place are free of charge and include: counseling services, support groups, health and wellness programs, and breast prosthesis and wig bank. To find out more about The Pink Ribbon Place, visit thepinkribbonplace.org. On-site registration: is available at various sites (please check www.pinkonparade.org for more information) and on event day at $40 for Survivors, $40 for Adults, and $30 for Seniors/Students. T-Shirts: Complimentary T-shirts are only available for pre-registrants who register before 11:59pm PST on 9/30. T-shirts will be available for on-site only at a first come first serve basis. 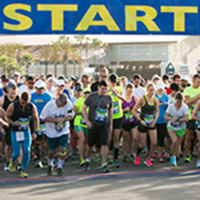 Course Description: Consists of two walk/run routes 1) 1.8K Family Fun Route (beginner) and 2) 5K Mt. Rubidoux Route (beginner/intermediate). What to wear/bring: Please dress in layers in case of inclement weather. Please be sure to wear proper shoes if you will be going up Mt. Rubidoux. Please leave all of your valuables at home, as we (RCHF) cannot be responsible for any lost or stolen property. There will be plenty of retail and food vendors so please be sure to bring some cash/credit card(s). Parking: Parking is available off of Palm Ave and Tesquesquite Ave. Parking at Ryan Bonaminio Park will be available at 7:30AM at a first come first serve basis. Select parking will be reserved for handicap access only.